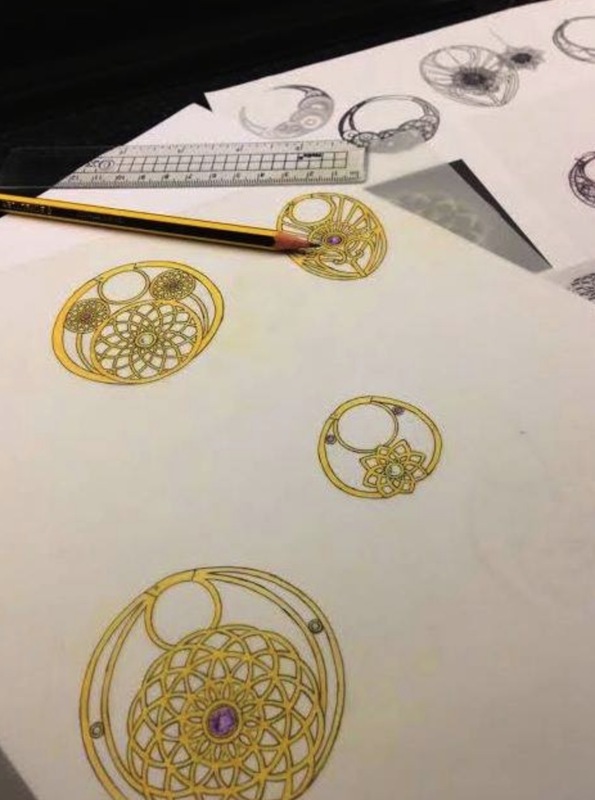 Jewellery designs and sketches from past projects. Here are some sketches of past projects from our archive going back 20 years. Coloured and carefully drawn sketches can take hours to create and so could be a sizeable part of the overall cost of a bespoke piece. Nowadays though, with help from Google, a customer can show us the different elements of design they like, from a few images collected from online sources. This helps our designers to better understand what the customer likes and then maybe only one sketch needs be drawn before the CAD work is started. Foliate sapphire and diamond bands and a cluster. Choices for a customer with stones from two old rings. Some choices for a knot themed necklace. An amazing buff top rectangular amethyst set pendant with ruthenium plated silver mount and chain. Redesign of diamonds from a customers' various rings. 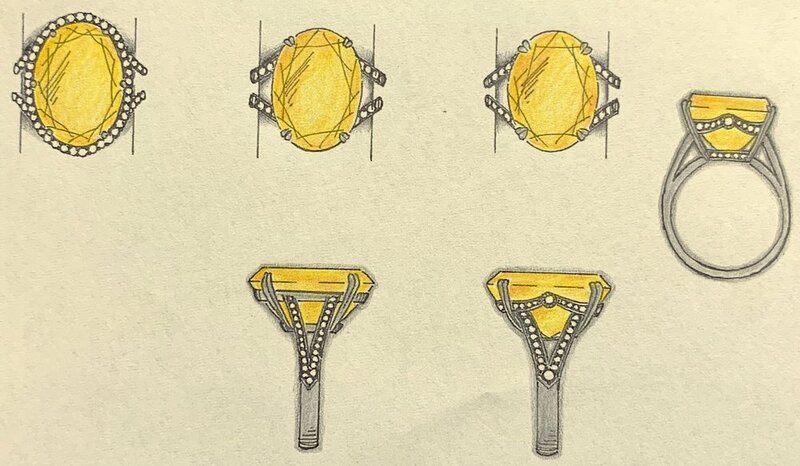 Sketches for an oval yellow sapphire ring mount. Designs for aquamarine, round and baguette diamond with detachable drop pearl. Choices for remounting a customer's aquamarine and small diamonds. Some choices fro a cabouchon aqua and diamond ring. Art Nouveau style designs for customers stones with enamel decoration. Variations on an Etruscan style wide band ring. Multi band ring designs for customers diamonds. Some design choices for remounting a customers diamond. More multiband designs. Perfect style for combining odd sizes of stones. Foliate scroll variations but with larger centre stone. 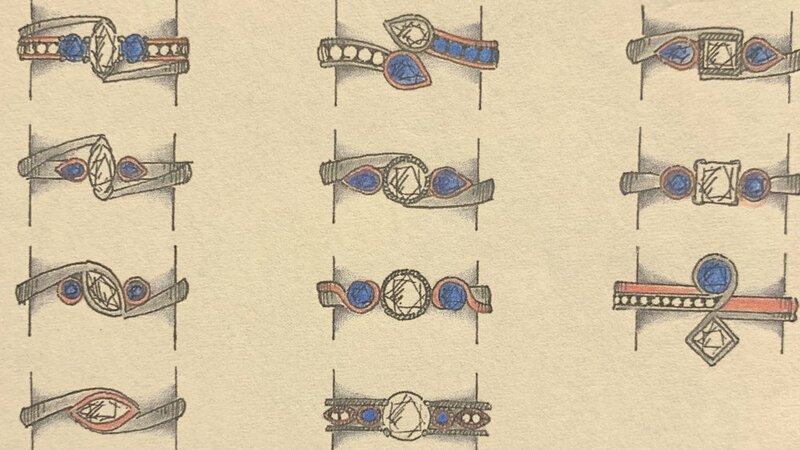 Design ideas for an engagement ring with sapphires and diamonds. Slight variations on a stacking ring set. Pretty, interwoven wirework scroll rings. Designs for a fitted wedding ring. California poppy designs for a necklace. Solid and open designs incorporating small diamonds. Stacking ring variations using customers diamonds. A multiband ring made with customers stones. Foliate and simpler designs for marquise and pear shaped rubies and diamonds. A delicate narrow band or a stronger double band for emerald. Variations for an initial D pendant with ruby set. Customers marquise sapphires, diamonds and pear shaped ruby- design choices. Three variations on mounting a piece of carved jade. Ideas for fitted wedding, engagement and eternity rings. Four designs for remounting a customers stones into two fitting rings. 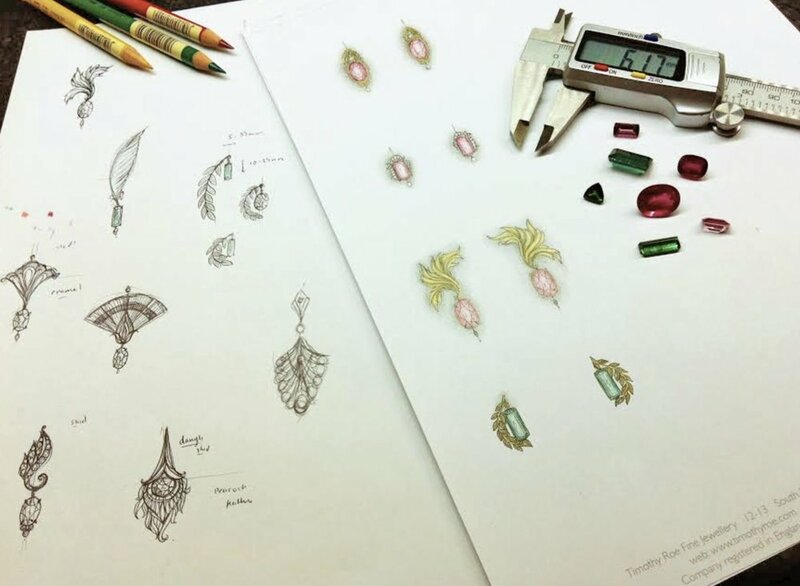 Designs for gold feather pendants with emerald drop. Designs for remounting stones from a worn-out emerald and diamond ring. Emerald, blue topaz and diamond necklace - chain to be added. Designs using customers gold for mounting a garnet using fine gold twists and granulation. Pink tourmaline ring design choices. White and yellow metal foliate scroll design. Interesting designs for a modern buff cut cushion amethyst. Designs fro a matching shaped diamond and tanzanite set eternity ring. Yellow and white metal combinations for a foliate design ring. Drop earrings set with coloured sapphires. 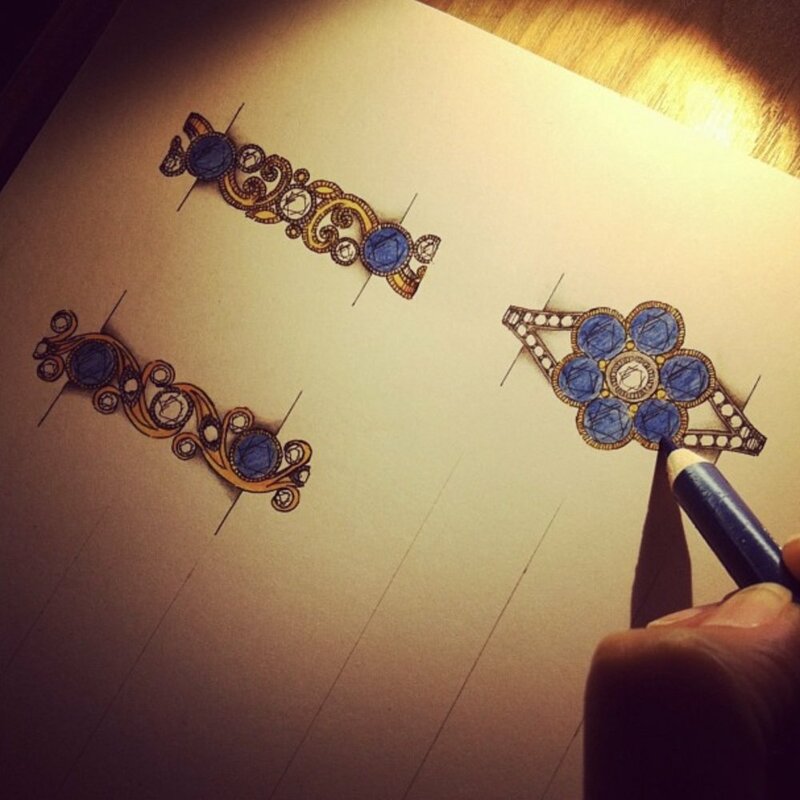 Designs for a heart pendant using customers own diamonds and sapphires. 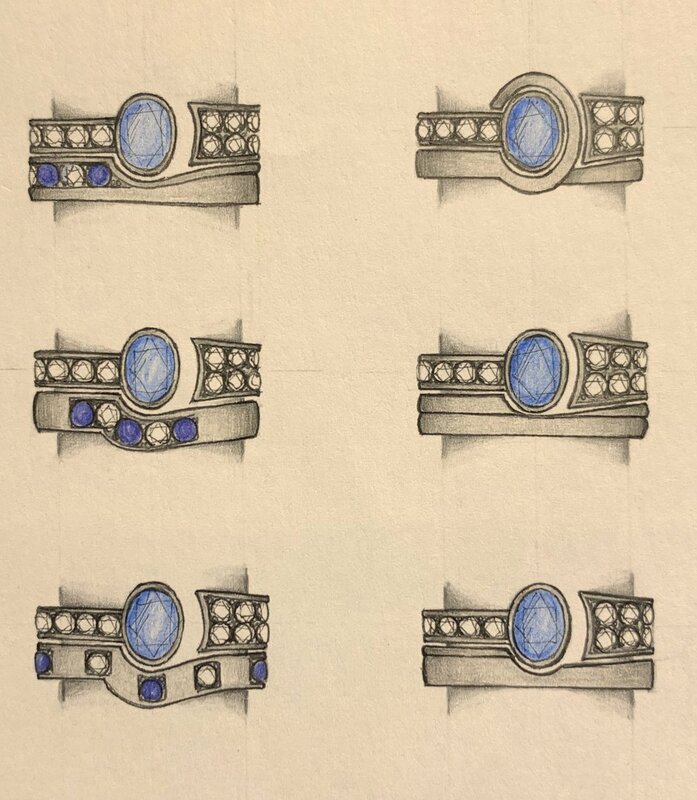 Five designs for a Tanzanite and diamond 3 stone ring. Rose gold, peridot and amethyst pendant variations. Celtic influenced ring design, laid flat. New ideas for stones removed from an old ring. More multi band rings for removed diamonds from unwanted rings. Making a solitaire not look like a solitaire anymore! With so many different sized diamonds a random layout is maybe the only solution.. 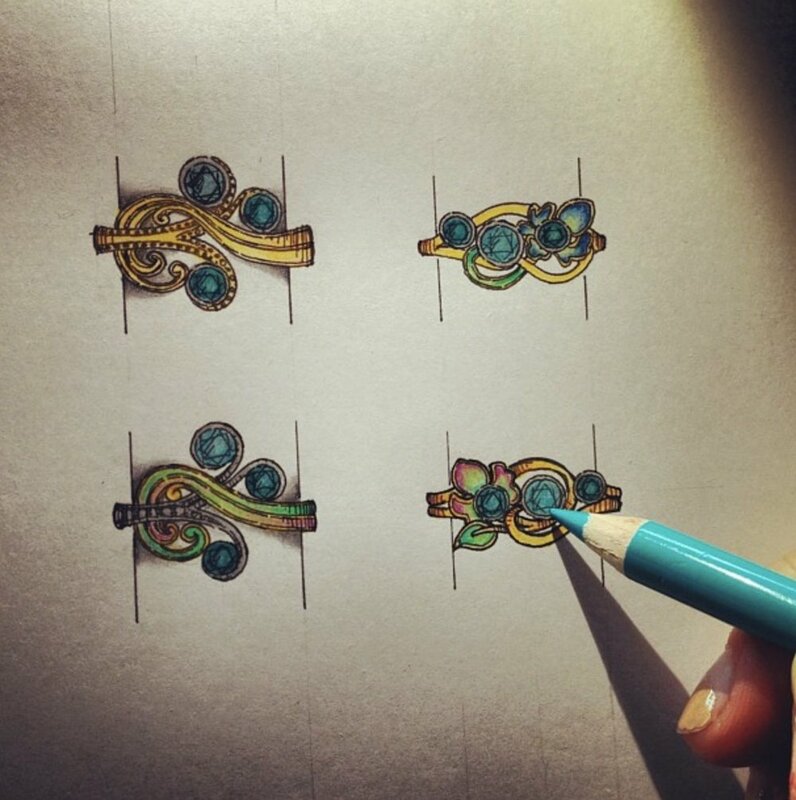 Designs for a close fitting hoop earring. Horseshoe diamond set pendant ideas. New designs using a customer's sapphire and diamonds. New designs for customer's diamonds from old ring. Varations on making a solitaire more interesting. Designs using customers three diamonds. Double bands of grain set diamonds framing a central feature stone layout. 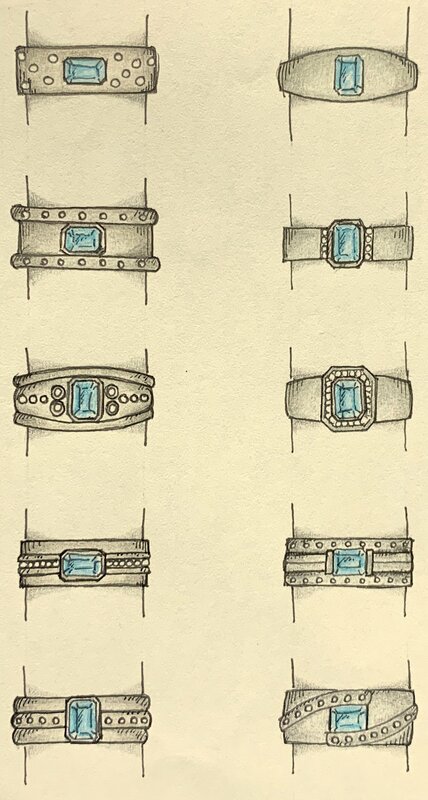 Designs for a little finger ring using a loose diamond. Choices for a pretty daisy cluster earring design. Unusually cut opal designs for pendant. Drop earring designs for 8 variable sized diamonds. Variations on a new design for a loose oval pink tourmaline ring. 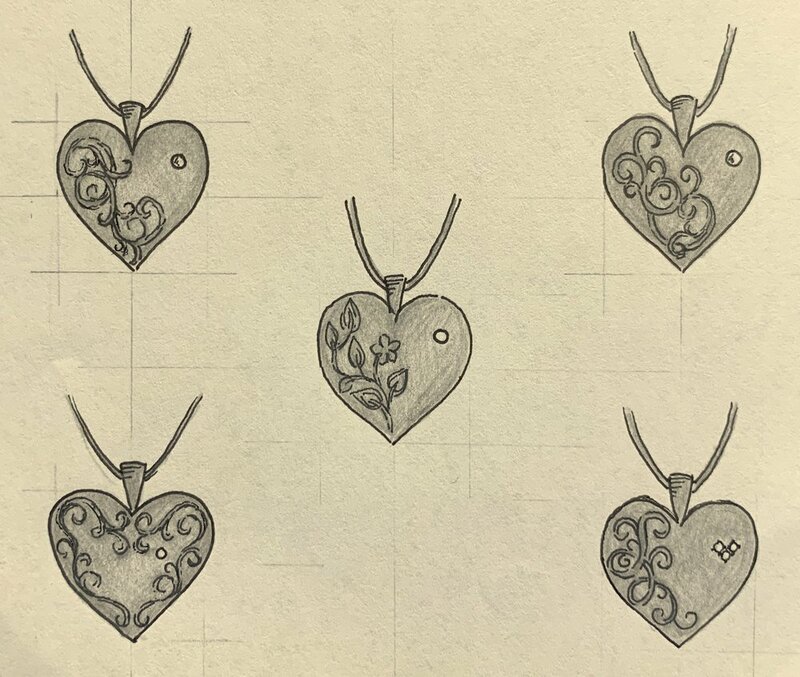 Foliate or simpler scrollwork decoration for diamond set heart locket. Further variations on a sapphire tension ring with fitted band.